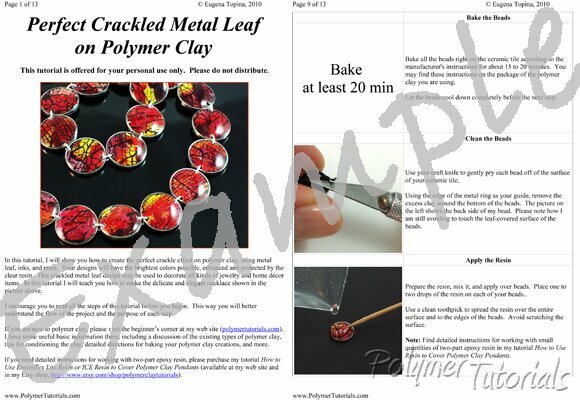 Follow this tutorial to obtain the perfect crackled metal leaf effect on polymer clay. What do I mean when I say that? That is simple. I mean: "pretty and durable". In other words, the colors shall be as vivid as possible and they shall stay that way for a very long time. As you can see, the colors in my metal leaf creations are really bright, the surface is clear and has a nice domed shape, and the entire piece is smooth like glass. Step-by-step instructions explaining how to make the necklace shown at the left (as well as how to make a pair of matching earrings for this necklace). Brilliant tutorial. Managed to produce really beautiful bead ..